Pence said the deal president Trump offered Saturday was the culmination of many meetings with both Democrats and Republicans on the issue of securing the U.S. southern border and reopening the portion of government that remains in a shutdown. He pointed to specific provisions that were proposed by Democrats and included in the president’s new offer. What you heard today was “a proposal to secure our border and end this partial government shutdown,” Pence conveyed. He said the president directed their team to engage Democrat leadership, and they’ve done that through a litany of meetings culminating in the White House meeting on January 9 that ended with “strong disagreement about priorities.” He also pointed to the president’s recent visit to the border. 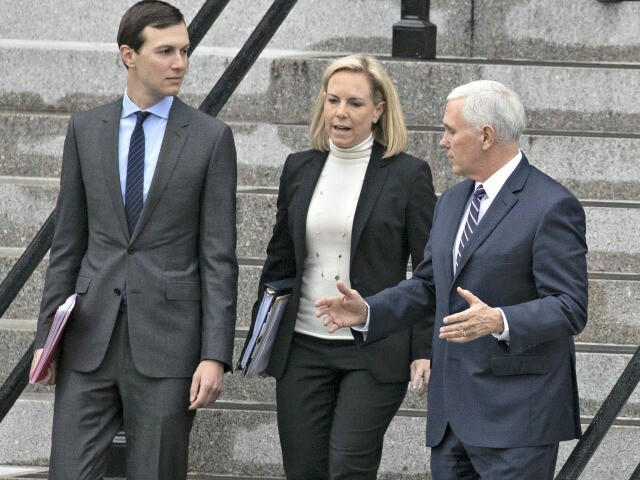 Following the January 9 White House meeting between Democrat and Republican leaders and the administration, the president charged his team to engage with leadership in the Senate and House to find a way forward, according to Pence. He said is was to include ideas from Republicans and Democrats and that those were included in today’s offer. “We have been reaching out,” said Pence referring to members in the House and Senate. He said they look forward to passing legislation this week in the Senate. Kushner pointed to the president’s overtures for broader immigration reform in Saturday’s announcement.